Did you just upgrade or install a new Ubuntu desktop, and want to add some extra useful and essential applications on it? Good. But, you should put some extra effort to find and install all those applications to get a near perfect Ubuntu desktop. What are you going to do? Are you going to manually search and install each applications by downloading the respective .debpackages or by adding some PPA repositories and install all of the essential apps? I bet it’s a quite time consuming process, and also someone may not know even what applications they should install to get a perfect desktop. Well, what if a single tool can do this all for you with a couple of mouse clicks? Yeah, you get it now. There is an interesting and a very important tool is available that can be used to install all essential and popular applications with a single or couple of mouse clicks? I know you’re getting curious to know. That tool is called “Ubuntu After Install”. Ubuntu After Install is a tool that can be used to install some of the best and essential software after installing the Ubuntu desktop. It has a bunch of useful applications, and will automate the installation process on a newly installed machine to get near perfect desktop. I would not say a complete desktop for all users, but a near perfect desktop. This tool saves your time and effort, and installs all latest versions of softwares by automatically adding the respective PPA’s to keep the installed softwares up to date on your Ubuntu system. 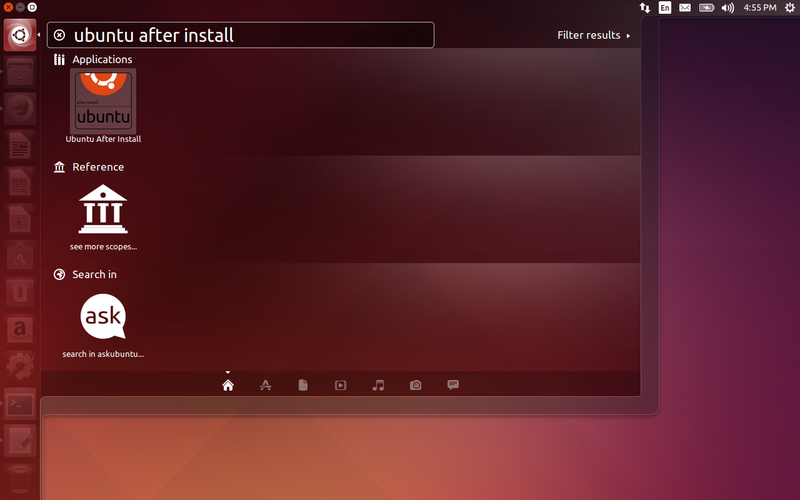 Add the ‘Ubuntu After Install’ PPA and install it as shown below. Alternatively, you can download the .deb file here, and manually install it yourself. After installing Ubuntu-After-Install, launch it either from Unity Dash or Menu. This is how Ubuntu-after-install looked after launching it. As you see in the above screenshot, it will display all useful softwares. The softwares that already has been installed will not be selected by default and marked with green colour dot. If particular software is not available for your Ubuntu version, then it will be marked with Red colour dot. 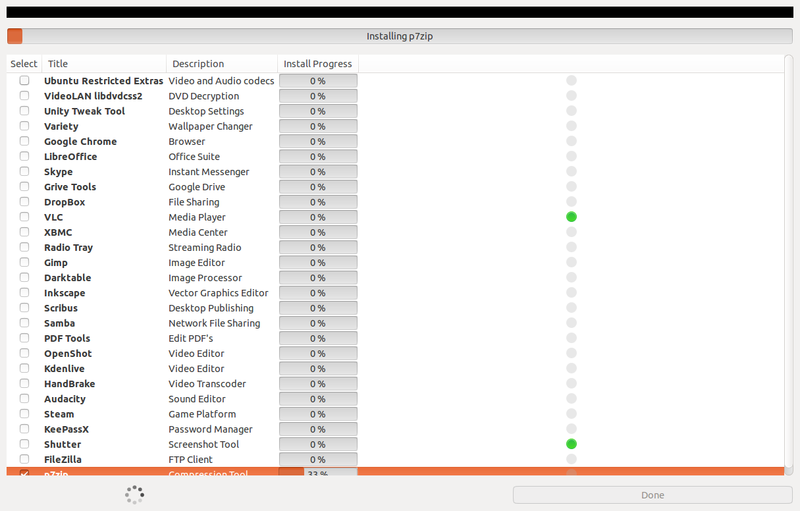 And, the softwares marked in orange colour will be re-installed/upgraded. Clear? Now, select the softwares that you want to install and hit the button Install Now. The PPA of the selected softwares will added automatically and the respective softwares will be installed on your system. Sounds good, isn’t it? For example, here I want to install only the p7zip compression utility on my ubuntu 14.04 system. So i selected p7zip package, and unchecked all of others. To begin the installation, just hit the Install Now button. Now, the install will automatically add the PPA of p7zip on your system and install it. Everything will be done automatically on background. So you don’t need anything to do. Just, be relax and watch the installation. If the software has been successfully installed, it will be marked as green colour dot. Please keep in mind that installing all applications at once will take a while to complete depending upon your Internet connection speed, and it is highly not advisable to interrupt the install process once it has begun. We have featured the Ubuntu Tweak tool a couple of days before. Ubuntu Tweak and Ubuntu After Install tools does the same job, but Ubuntu Tweak has a lot of features over Ubuntu After Install. Ubuntu After Tool is only intended to install all best and daily usage softwares on your machine, whereas Ubuntu Tweak tool will do couple extra stuffs such as customizing your Ubuntu desktop and more. Stop wasting your precious time by searching “things to do after installing Ubuntu” related stuffs on the web. Ubuntu Tweak and Ubuntu After Install are both definitely will help for those who are searching for things to do after installing Ubuntu desktop. Go, get it and do things more quickly and precisely. Good luck!